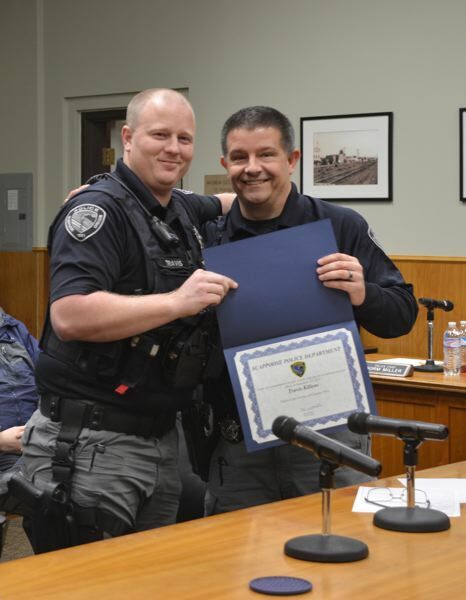 Scappoose Police Officer Travis Killens was recognized with an award Monday, Dec. 3, for actions he performed during a house fire in Scappoose earlier this year. Scappoose Police Chief Norm Miller presented Killens with an award during a Scappoose City Council meeting for "going above and beyond" while on duty. Miller presented Killens with a certificate and provided city officials and observers in the audience with a narrative of what led to Killens' recognition. "[On] Sept. 3, Travis was on duty that night," Miller said. "He was monitoring all the channels, as he does. He wasn't even dispatched. He heard it over the radio, a fire at a house. He dispatched himself to the fire, he went there, saw there was several people around, he saw it, he assessed, made contact, and found that there was other people still kind of in the house a little bit." Miller said Officer Killens made a plan with some citizens nearby to get people out of the home. "Tonight we're honoring him for going above and beyond the call of duty that night," Miller added. "Travis has been an exceptional officer for the Scappoose Police Department. He has grown tremendously from the time he started as a reserve until now."